Plaza Independencia is strategically located between Fort San Pedro and the building that used to be the Gobierno Provincial in the downtown area of Cebu. The plaza is a popular hangout for many living or working around the area. It is one huge garden filled with trees, ornamental plants and flowers. There is also a public skating rink and a kiosk at the center of the circular skating rink. 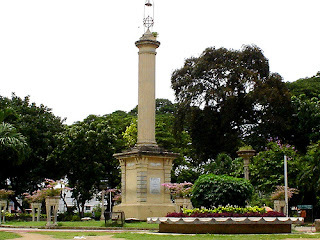 An obelisk dedicated to the memory of Miguel Lopez de Legazpi ,the first Spanish governor-general of the Philippines, is planted at the very heart of the plaza. Plaza Independencia is the most historically significant plaza in Cebu. Its land and age-old acacia trees are witness to the many phases and stories of Cebu’s rich history. In the early 1600s, it was called Plaza de Armas. When it was widened later on and expanded to reach nearby properties of the Cathedral of Cebu, it was called Plaza Mayor. Later in the Spanish rule, it was further landscaped and developed and was christened Plaza Maria Cristina, in honor of the queen regent. During the American colonial period, its name was changed to Plaza Libertad, as the Americans asserted how they liberated Cebuanos from the Spanish rule. Later on it finally became known as Plaza Independencia. In a road tunnel construction project in 2006 that touched a part of the plaza and nearby areas, pre-Hispanic human bones and some earthenware were uncovered. In 2008, some artifacts were unearthed which included gold death masks, a pair of gold earrings, a Thai bluish-green “guan” celadon, jars and other earthenware. Plaza Independencia and some strategic parts of the downtown area of Cebu is a rich archaeological field due to its history as a prehispanic settlement and trading port. Indeed, there are many secrets and stories from Plaza Independencia.